Did you know that a lake or pond, left to nature, has a distinct lifespan? Sediment in stormwater runoff, grass clippings, leaves, and other yard debris that find their way into the lake or pond add nutrients and accumulate on the bottom. This accumulation of nutrient rich sediment will gradually reduce the depth and volume of the pond while also feeding harmful algae growth. As owners and managers of ponds, we play an active role in maintaining the “healthy lifestyle” of a pond through the management program we choose and implement. A properly maintained lake or pond often has aeration, healthy riparian buffers and well established populations of beneficial aerobic bacteria. This integrated approach to lake and pond management helps prolong the life of your waterbody, making it healthy and enjoyable for you and the aquatic life which inhabit it. But, even well maintained lakes and ponds, over time, will have to face some amount of dredging, which will likely be one of the most costly projects that a community or pond owner will undergo during the life of their lake or pond. Proper planning for a dredging project could mean cost savings. SOLitude Lake Management recommends that you have a bathymetric and sedimentation study performed every three to five years (in conjunction with the community reserve study) to make certain that the bottom of your pond isn’t changing more rapidly than you are anticipating. Having the study performed on a regular basis will help to establish patterns and will assist in determining the size, magnitude, necessary budget, and timing for future dredging projects. 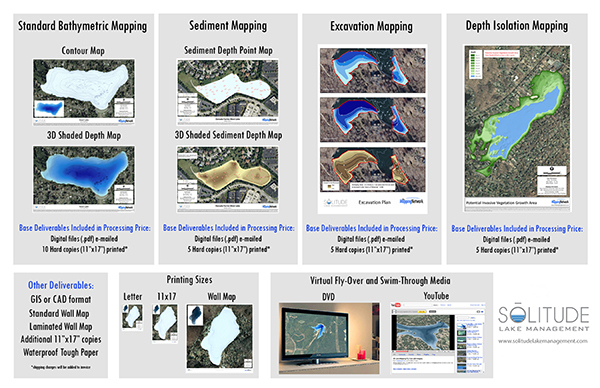 Above and beyond dredging, bathymetry and sedimentation mapping can be used for many other purposes. 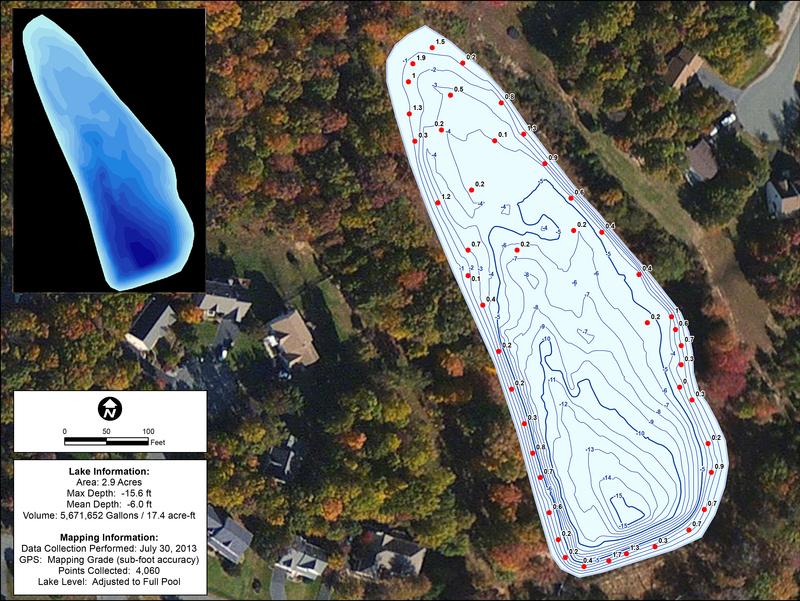 Bathymetry will provide much needed pond information such as precise surface acreage and depths. This knowledge can provide a new world for pond owners and managers. It can help you properly place aeration or structural fish cover within the pond, provide accurate information for fish stocking and can even give fishermen an idea of where the fish are hiding, should the lake or pond be used for fishing. SOLitude offers high-quality, state-of-the-art lake maps. Our highly skilled professionals use precise instruments to gather the data necessary to create a variety of images in various formats. We highly recommend that you consider all aspects necessary to plan for the long term management and health of your lake or pond, and take a very close look at what is going on below the surface…it might surprise you! Contact SOLitude Lake Management to speak with an expert biologist, ecologist or scientist for all of your lake, pond and fisheries management needs. 888-480-LAKE (5253) or info@solitudelake.com. Services available in VA, NC, SC, MD, PA, DE, WV, NJ & NJ. Aquatic products and consultation are available nationwide. This entry was posted in Lake Map, Sediment and tagged Bathymetric Map, dredge bid, dredge costs, dredge pricing, Dredging, Engineer Bathymetry, Engineer Lake Map, Fishing, GIS, GPS, GPS Lake, GPS Map, Habitat, Hunting Land, Hunting Property, hydrographic survey, lake, lake dredge, Lake Management, Lake Map, Lake Mapping, Lake Survey, map, Sediment, Sedimentation, smith mountain lake, smith mountain lake bathymetry, smith mountain lake map, Survey, The Mapping Network, Virgina Lake Management, Washington Lake on August 15, 2013 by Moderator.